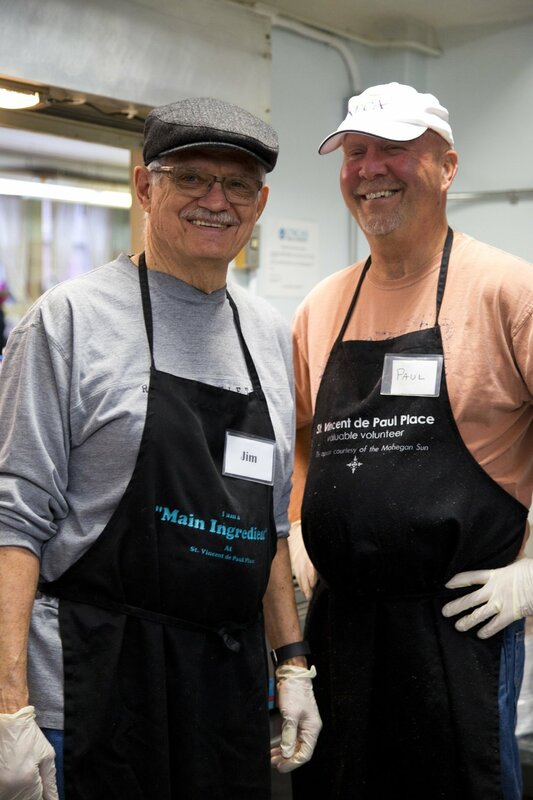 Please consider volunteering at St. Vincent de Paul Place. Kitchen volunteers help with food preparation, serving, and clean up. Pantry volunteers stock shelves, sort incoming food, and assist patrons during their food selection. Front desk volunteers provide general office assistance, including answering the phone, signing up new food pantry patrons, and answering questions. Additional volunteer tasks include: food pick-up , general maintenance, writing newsletters, writing grants, bookkeeping, inventory, and special projects. If you email us using the form below, we can set up a time for you to come in to discuss your availability, and our needs. Work with us to find your own niche. If this is a requirement for school or work please note that in your email. If you are looking for Court Ordered Community service please visit that page. Please use the email form below to contact Bonnie. All Volunteers Must Be Eighteen Years Old. Teaching children about charity. If this offer to volunteer is a school or business requirement please describe the program and number of hours you need . Volunteers help prepare healthy menus often including fresh produce..